With its cutting edge PC optimization software and above-standard registry cleaner technology, PC HealthBoost (R) software is head and shoulders above its competition in delivering speed, performance, and stability to your PC. In just 2 minutes, the PC HealthBoost application scans your system, finds and repairs critical errors in your registry, boosts PC speed and stability, cleans slow computers, and improves overall power. PC HealthBoost software is unique in that it uses a unique algorithm (called ScanSafe) to clean the Windows (R) registry that's safer and more stable than your garden-variety registry cleaner. PC HealthBoost software has set a high standard for PC cleaning and error repair in terms of: ease of use, safety, and the performance boost your PC will see. The PC HealthBoost application solves many common problems that affect most PCs, such as slow boot times, frequent crashes and system freezes, blue screens of death, and more. Registry Rinse 2007 is Registry-cleaning software. It will safely Clean and repair Windows Registry problems with a few clicks and enable you to enjoy a cleaner and more efficient PC. The Registry is the nerve center of your PC, and problems with the Windows Registry are a common cause of Windows crashes and error messages. 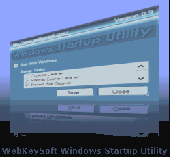 Windows Startup Utility is a free utility working at Windows startup that clean specials folders and that clean the Windows registry. The specials folders concerns the list of recently used files, cookies, temporary Internet files, or temp files. RegistryEasy is award-winning Windows Registry Cleaner that scans your PC and safely cleans errors and invalid entries that cause system slowdowns, freezing and crashing. RegistryEasy repairs registry problems to make your PC run like new again!